Periprosthetic fractures are increasingly frequent. The fracture may be located over the shaft of the prosthesis, at its tip or below (21). The treatment of explosion fractures is difficult because the shaft blocks the application of implants, like screws, which need to penetrate the medullary cavity. The cerclage, as a simple periosteal loop, made of wire or more recently cable, does not only avoid the medullary cavity. Its centripetal mode of action is well suited for reducing and maintaining radially displaced fractures. Furthermore, the cerclage lends itself well for minimally invasive internal fixation. New insight challenges the disrepute of which the cerclage technology suffered for decades. The outcome of cerclage fixation benefits from an improved understanding of its technology, mechano-biology and periosteal blood supply. Preconceived and generally accepted opinions like "strangulation of blood supply" need to be re-examined. Recent mechanical evaluations (22) demonstrate that the wire application may be improved but cable is superior in handling, maintenance of tension and strength. Beside the classical concepts of absolute and relative stability a defined stability con-dition needs consideration. It is typical for cerclage. Called "loose-lock stability" it specifies the situation where a loosened implant allows first unimpeded displacement changing abruptly into a locked fixation preventing further dislocation. The goal of surgical fracture treatment is to restore early and complete function of bone, limb and patient. Cerclage, could be an attractive because simple technique. Still cerclage, as exclusive procedure is not strong enough and therefore does not allow functional aftercare. When used protected by external plaster splinting extensive immobilization prevents early function. As this procedure combines the disadvantages of both, the surgical and the conservative methods, it "hibernated" for decades (14). Its disappointing early results are listed in Table 1. Cerclage has seen a revival with the increasing demands and incidence of periprosthetic fractures. While locked compression plates offer help in metaphyseal fractures (8), in periprosthetic fractures the intramedul-lary cavity is not available for penetrating implants (Fig. 1) but the stem of the prosthesis may function as an internal splint. Therefore, periosteal fixation by cerclage appears to be a valid alternative. The use of cerclage, on the one hand, as a temporarily applied tool has seen wide application in the reduction of multifragmented periprosthetic fractures. On the other hand, cerclage as a permanent fixation device may contribute to the long term stability of periprosthetic fracture fixation when combined with internal splint by stem and/or locked plate. The term "cerclage" is used here only for periosteal wire loops placed perpendicularly to the long axis of the bone. The tension band wire acts differently and is not considered. While the wire loop exerts a centripetal force reducing and keeping radially displaced fragments together, the tension band wire in turn transmits traction producing dynamic compression according to the requirements of function (3). In the following the different functions are outlined, and then a review of the earlier results of cerclage serves to consider the functions and its requirements at the basis of the evolution of cerclage technology. Recent new insight into mechanical, mechano-biological and biological aspects allowed improving the cerclage as a tool and as an implant. The cerclage functions in two basically different applications. It may be used for reduction of the fracture during surgery. Thus the cerclage functions momentarily as a tool (Fig. 2). This application was never contested because it is an efficient way to reduce multiple fracture fragments. The following discussion focus centers on the application of cerclage as an implant. When cerclages function as implants they may be used alone or together with a protecting device such as external or internal splint. The shortcomings of an application without protection originate from insufficient mechanical strength. As a rule the cerclage alone cannot maintain stable fixation withstanding the load from functional aftercare. The situation is aggravated when the cerclages cannot be spaced enough to provide sufficient leverage (Fig. 18 and Fig. 19: Spiral fracture with butterfly fragment. In each fragment the wires are positioned 1 cm remote to the fragment tip. Applying this rule to a butterfly fracture shows that the lever arm between the outermost cerclages in the same fragment is e.g. 2 cm. This explains why butterfly fractures lend themselves not for cerclage fixation. In the past the cerclages were protected by an external plaster cast. The shortcoming was that the protection was often insufficient due to loose coupling across soft tissues between the plaster and the bone. The procedure also combined the disadvantages of surgical and conservative treatment. Good results were rather the exception than the rule. The weakness of the single wire cerclage led to the development of the twin folded cerclage, which takes advantage of a doubled wire (12). This did improve the situation but still required additional protection by plaster and needed application of many cerclages (Fig. 3). The major change brought about by today's technology consists in protecting the cerclage using internal instead of external splinting. Such splints are plates, nails or stems of the prosthesis or a combination thereof. Furthermore the connection of the wire is now improved. The use of the internal splint provides tight coupling of a rigid splint. A typical application consists of applying a splinting locked plate which connects the main fragments. The cerclage then is used to reduce and maintain radially dislocated fragments. When applied to peri-prosthetic fractures the cerclage can also replace or support plate screws for fixation of the plate to bone Fig. 4. To take advantage of the potential of cerclage the first step consists in reducing the trauma brought about when passing the cerclage around the bone. Basic requirements were optimal instrumentation allowing minimally invasive application of the cerclage. Furthermore mechanical performance needed improvement; deleterious mechanobiological reactions were to be avoided. Last but not least keeping blood supply to bone and soft tissues intact was an essential requirement. The dislodging of the soft tissue when guiding the cerclage around the bone with conventional instruments may result in damage of the soft tissues, of the blood supply to bone and it may inadvertently strangulate major blood vessels. The conventionally used instrument for passing the cerclage around the bone is shown in Fig. 5. It consists of a cannulated half circle with a straight or angulated handle. The half circle is guided around the bone. Allowing insertion of the cerclage at one end and catching the cerclage protruding at the other end requires a major dislodging of the soft tissues (Fig. 6). With the new MIO wirepasser such dislodging is minimized (Fig. 7) because the insertion of the wire and its exit are accessible within the handle outside the body. The application of the MIO wirepasser is visualized in (Fig. 8 through Fig. 11: Final step: The two halfs of the wire passer are assembled outside the body. The wire passer forms now a full circle and the wire can be passed through from outside as shown. Disassembling is done in reverse sequence from Fig. 11 back to Fig. 8 whereby the cerclage is left in place. To reduce tissue dislodging and with it to minimize vascular damage the wires can be applied using a tool which consists of two semi circles. This allows guiding the two halves through a small incision and snugly around the bone. Thereupon the two halves are connected forming a full channel around the bone allowing to feed the wire or cable through. Disassembly and removal of each half sequentially leaves the cerclage in place. The cerclage cable consists today of a multitude of finest metal fibers braided to form subassemblies which in turn are braided and twisted to form the final cable. The free end of the cable is fed through a hole in the crimp where it comes to rest due to the larger ball attached to the other end of the cable. The free end is then passed around the bone and inserted through the second opening in the crimp (Fig. 13). Tension is then applied e.g. with the instrument shown in Fig. 15 and using a special forceps (Fig. 16) the crimp is squeezed to maintain the tension applied. The cross sectional structure of such a cable, mostly made of titanium, is visualized in Fig. 23. The improvements of cable technology concern the junction of the free ends applying improvements to the conventional crimping technology (10) and instrumentation for cutting. As Wähnert et al. show the crimped cable connection is more resistant than the twisted wire connection. 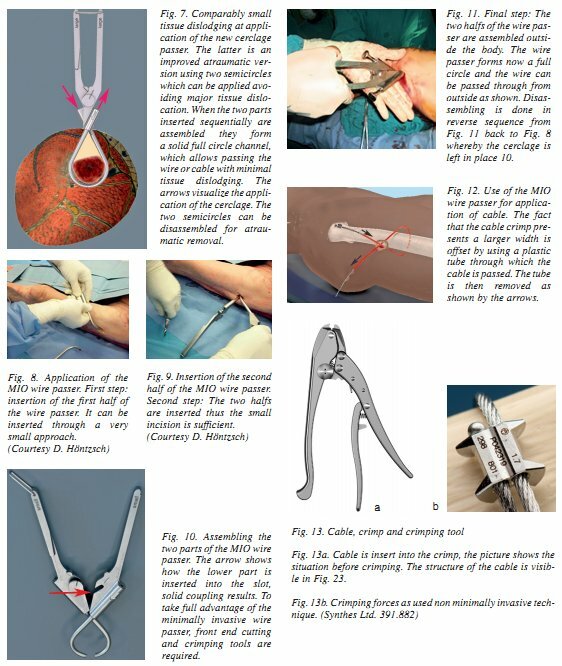 The application of the cable cerclage under minimally invasive conditions requires a special tool for tensioning and maintaining the cable during surgery. It consists of a pencil like tool (Fig. 15) that allows to tension through a small incision. The main body of the tool carries a knurled knob which when twisted applies tension. The temporary tension holder can be locked and disassembled maintaining the tension while additional cables are applied (Fig. 15a left). The next step in the development of minimally invasive cable cerclage will have to solve the problem of crimping (Fig. 16) and cutting through a small approach. While the handling of the twist connection of the cerclage wire is critical and bending flat as well as cutting the twist results in drop of tensions as Wahnert observed (22) squeezing and cutting of the cable is not critical. When cables are applied to a metaphyseal bone which tapers from large to smaller diameter the cable slides on an inclined surface from large to smaller diameter. This results in loss of tension. To prevent the said displacement of the cable along the plate the cable is fed through eyelets which are locked within the screw hole. 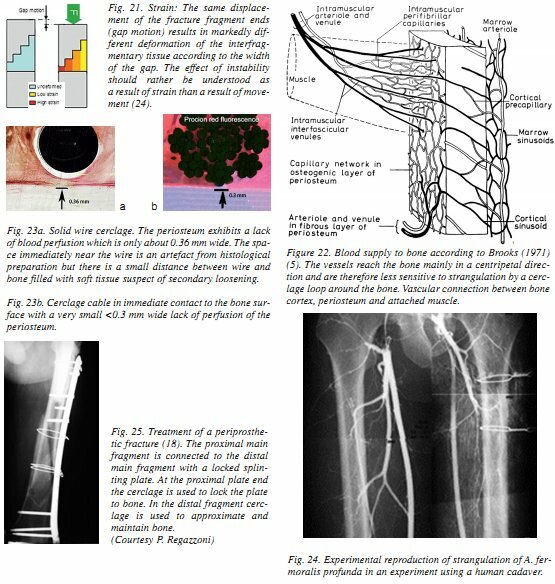 The improvements of wire technology consist of avoiding recently detected pitfalls regarding mechanics and mechanobiology as outlined in the following paragraphs. The improvement concerns rather application than instrumentation. Cerclage loops may be made of metal or plastic. The metal of wires is mostly steel, the use of titanium is also reported (23). Plastic will not be considered here because of its lack of strength which led to increasing the dimension of the loop cross-section and with it increasing the area of contact impeding blood flow. Stress relaxation with creeping loss of pre-tension is also a disadvantage of some plastics. The metal loop may consist of a solid wire or of a multi stranded cable (9). The connection of the wire may consist of a simple twisted knurl that induces and maintains the tension of the solid wire. When playing with different modes of application of the knurled twist it became apparent that the stability provided by the solid wire was strongly affected by the amount of plastic deformation of the twist (Fig. 17). The critical part of the twist determining the achieved and maintained tension in a solid wire cerclage is the innermost turn i.e. the one turn near the bone surface. This effect has been recently studied by Wahnert et al. 2011 (22). Their results show that a twist may be inadvertently applied in a way which due to elastic spring back does not maintain sufficient tension. To avoid such an effect special attention is required. Tension is sufficient if it holds the fracture fragments together without dynamic displacement during functional aftercare. Wahnert shows that for installing sufficient tension the wire must be twisted in way to produce plastic deformation of the twist including the turn near the bone. The improved application is based on understanding the underlying mechanics and acting upon rather than being guided by gut feeling. Insufficient wire tension creates a condition of micromotion at the interface between bone and cerclage when the functional load exceeds the compressive preload of the cerclage. This condition is deleterious because it induces a mechano-biological reaction resulting in secondary loosening (see below). The twist of the wire may stick out and irritate the surrounding tissue. It is, therefore, standard technique to cut the twist and bend it flat onto the bone surface. The same authors have shown that there is an important effect depending on how the bend is produced, either maintaining the tension or abolishing it. One further aspect of the knurled twist which requires attention is that when applying torque there is a possibility that one wire stays straight and the second wire turns around it resulting in an asymmetric twist which probably forgives strength. The ideal twist consists of symmetrically deformed wires. To assure this type of deformation the surgeon applies at the same time torque and traction which tries to pull the twist away from the bone surface in order to avoid that one wire remains straight. This is general knowledge among the surgeons using cerclage. A generally accepted rule concerns positioning of the wire loops in relation to the tip of the bone fragments. For best leverage one tries to space the cerclages along the long axis of the bone as far as possible towards the tip of the fragments. Still, because the fragments tapper and become fragile towards the tip, the rule is to place the outermost cerclage at least 1 cm from the tip of a single fragment (Fig. 18) (12). When one applies this rule to e.g. a butterfly fragment it is obvious that keeping the distance of 1 cm for each tip of a fragment the leverage may be compromised. This effect may explain why cerclage treatment of butterfly fragments requires additional splinting in practically all cases (Fig. 19). One question, which requires further attention, concerns the mechanical load which the cerclage wire exerts onto the bone. The high tension of the wire especially under functional load together with the small area of contact may imply the risk of local mechanical overload exceeding the strength of bone. Here further studies are required to find the optimal balance between stabilization and strength of bone. The use of cerclage in the treatment of periprosthetic fractures will profit from application of new insight in bone reaction (15). The first "pressure necrosis of bone" is not induced by even high static compressive forces acting onto the bone or fracture surface. Living bone can tolerate static compression up to but not reaching the limit of mechanical strength (17). The effect of micro-motion at the interface of bone-to-implant or bone-to-bone is that bone "backs out" by resorption whereby the distance between implant and bone is increased by bone surface resorption (Fig. 20b). The increase of the distance reduces in turn the mostly high dynamic strain (Fig. 21) at the bone surface. A minimal level of dynamic strain is on the one side the basis of inducing bone formation. Therefore, one observes the appearance of callus under conditions of instability. When, on the other hand, the strain exceeds the limit of tolerance namely the elongation at rupture of bone (16) the bone cannot bridge the gap and a nonunion results when this condition lingers on. Blood supply to bone is an essential prerequisite for uneventful bone healing. Two mechanisms are in the foreground when considering the effect of cerclage upon blood supply to bone: 1. passing the cerclage around the bone and 2. the effect of the contact between cerclage and bone surface. Any contact of an implant with the bone surface covers by necessity a surface area and impedes blood inflow and outflow (7). When the cerclage consists of a solid wire or a cable the area of contact is a rather narrow line and its effect on blood supply to bone is minimal. If the cerclage consists of a band like plastic strap, one can assume a somewhat larger avascular zone. To prevent vascular damage of cerclage bands with wider contact area, these bands are often provided with means keeping the contact to bone small. Plastic straps have been introduced with small transverse undercuts to produce a surface that reminds a cogwheel. Another way to reduce the area of contact is the use of protrusions. Similar designs have been proposed for wires such as elevating the wire from the bone surface using spheres for the same purpose. As the vascular damage of the wire is small and because the reduction of contact area results in comparably high local surface stress we consider the use of wires with spacing spheres not to be an essential or urgent solution. Strangulation of periosteal blood vessels? A frequent argument put forward against the use of cerclage for "permanent" application is that the cerclage would strangulate the bone blood supply. Fig. 22 visualizes that the blood supply reaches the bone essentially in a radial direction (5). Thus one can expect that the strangulation would have a small effect. Rhinelander and Stewart (1983) have shown in the rabbit that the necrosis is minimal (19). In our own hands application of wires and cables results in a minimal area of impeded blood supply. In a pilot experiment on sheep using fluorescent dyes to visualize the blood perfusion area, the effect of the cerclage was minimal (Fig. 23) (6). Strangulation of the superficial femoral artery has also been reported (1). The inadvertent strangulation of a major artery has been observed in clinic (13) and in a cadaveric experiment Fig. 24 (2). This is a major complication which should be avoided by guiding the tip of the wire passer in contact with the periosteum. Fig. 25 shows a typical application of cerclages in the treatment of a periprosthetic fracture under consideration of the mentioned aspects for improvement. Within the proximal fragment the medullary canal with the stem of the prosthesis obstructs the use of penetrating implants and/or reduces the anchorage of periosteal splints. Plate screws when locked can either be used as unicortical screws or if they are of the variable angle locked (VAL) type they may be tilted such, that they avoid the medullary stem while maintaining angular stability. In any case the cerclage wires improve fixation and approximate fragments. As supplementing implant their limited strength is acceptable at least for the application mentioned. Considering the fixation with cerclage, the conventional terms for stability, namely absolute and relative stability, require the definition of an additional type of stability, which is distinctive for cerclage stabilization: "loose-lock stability" with its two distinct components. - Sufficient strength of the wire. The rare incidence of wire breakage outside the twist indicates that wire strength is usually sufficient to withstand functional load. - Sufficient strength of the connection between the ends of the wire (e.g. the knot). When the loop fails this happens usually by opening of the wire connection with or without wire breakage within the twist. - Maintained close reduction of the bone fragments (i.e. no slippage of the fracture surfaces). Even small adjustments of fragment position may result in gross instability because the tension of the wire is lost. - Maintained mechanical integrity of the entangled bone fragments (i.e. no fracture of the tapered ends of the fragments). This problem occurs when the wire is placed too close to the tip of the fragment. Reversible displacement, as observed when fragments are splinted with an elastic element, is correlated to the load applied and inversely correlated to the stiffness of the splint. Functional loading will result in displacement within the fracture which is restored at unloading by returning of the fragments to their original position. The occurrence of relative stability is a rather rare incidence after cerclage application. - Phase 1: If the wire is initially not under tension, the wire does not stabilize and the fragments displace freely. - Phase 2: With increasing displacement of the fracture fragments the wire is tensioned and obstructs further displacement. The fragments are thereby stabilized mostly in some degree of malalignment. In phase 1 minimal load will displace the fracture fragments; still, after a certain amount of travel the fragments will abut against the wire loop and then in phase 2 further travel is minimized. This situation represents a combination between free displacements of the fragments changing abruptly into an elastically (or plastically) resisted displacement. This is a frequent situation after application of a cerclage similarly to the situation of conventionally locked i.m. nails where also two different phases of stability (loose-lock) prevail. The same holds true for an external plaster with its loose coupling. It also is the case when resorption of the bone at the interface results in loss of contact between bone and implant and also between bone and bone e.g. at fracture surfaces. Cerclage can offer essential help in the treatment of periprosthetic fractures where the stem of the prosthesis impedes the use of implants which need to penetrate the medullary cavity. Cerclage used as an implant suffered in the past from disrepute based on mostly disappointing results when applied to diaphyseal fractures together with plaster. Replacing the external plaster splinting with solid internal splints like locked plates, nails or stems of prostheses opens a new field of stabilization using cerclage. This combination is applicable to periprosthetic fractures but most probably also to multifragmented diaphyseal fractures. Together with improved technology of application, taking advantage of a better understanding of mechano-biological bone reaction and considering that cerclage damages blood supply to bone less than expected, cerclage is a potentially valuable tool and implant. Wire technology can be improved but cable technology is definitively stronger and maintains better ten- sion (Wahnert). Wherever applicable, cables offer better performance. The conventional terms describing stability of fixation, namely either "absolute stability" or "relative stability" need to be supplemented for cerclage applications by the term "twin loose-lock stability". Loose lock stability applies to cerclage but also to conventional locked nails and to the situation produced by biological loosening of any implant. 1. ALETO, X, RITTER, M. A., BEREND, M. E.: Case report: superficial femoral artery injury resulting from cerclage wiring during revision THA. Clin. Orthop. Relat. Res. 466(3): 749-753, 2008. 2. APIVATTHAKAKUL, T.: Personal communication. 2010. 3. BARTONÍČEK, J., JEHLIČKA, D., STULÍK, J.: Tension cerclage using scewsa forgotten technique? Acta Chir orthop. Traum. Čech., 68(3): 188-191, 2001. 4. BAUMANN, E.: The material to be used for cerclage of bones. Schweiz. Med. Wochenschr., 86 (Suppl 20): 533-534, 1956. 5. BROOKES, M.: The blood supply of bone. An approach to bone biology, London, Butterworth & Co. Publishers Ltd., 1971. 6. FERNANDEZ, A., MILZ, S., PERREN, S. M.: Personal Communication. 2010. 7. GAUTIER, R., PERREN, S. M.: Die Reaktion der Kortikalis nach Verplattung - eine Folge der Belastungsveraenderung des Knochens oder Vaskularitaetsprobleme? in: Die Plattenosteosynthese und ihre Konkurrenzverfahren, Springer Verlag. 1991, 21-37, 1991. 8. KRBEC, M., MOTYČKA, J., LUNACEK, L., DOUSA, P.: Osteo-synthesis for periprosthetic supracondylar fracture above a total knee arthroplasty using a locking compression plate. Acta Chir. orthop. Traum. Čech., 76(6): 473-478, 2009. 9. LABITZKE, R.: From "bone suture" to modern osteosynthesis a chronology. Chirurg, 66(4): 452-458, 1995. 10. LABITZKE, R.: [Ankle arthrodesis using the cable technique]. Oper. Orthop. Traumatol., 17(4-5): 392-406, 2005. 11. LEEM ANN, R.: Indications for the technic of cerclage in leg fractures. Helv. Chir. Acta, 21(5-6): 480-492, 1954. 12. LEEMANN, R. A.: Notch cerclage as a technical improvement in winding of wires in fractures of long hollow bones. Chirurg, 28(2): 60-64, 1957. 13. MEHTA, V., FINN, H. A.: Femoral artery and vein injury after cerclage wiring of the femur: a case report. J. Arthropl., 20(6): 811-814, 2005. 14. MUELLER, M., ALLGOEWER, M., WILLENEGGER, H.: Technik der operativen Frakturenbehandlung. 1963. 15. 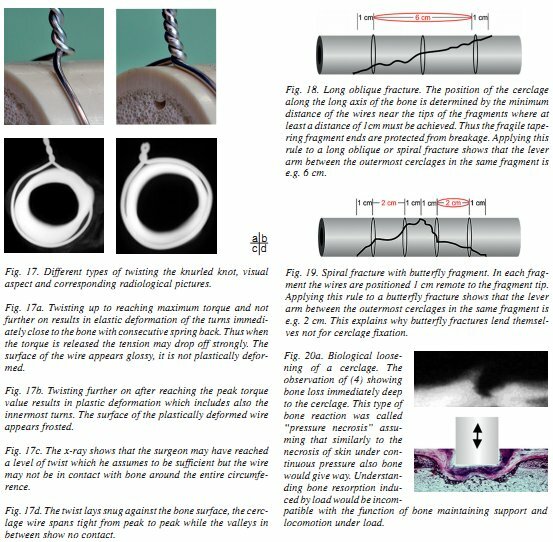 PERREN, S. M.: Evolution of the internal fixation of long bone fractures. The scientific basis of biological internal fixation: choosing a new balance between stability and biology. J. Bone Jt Surg., 84-B: 1093-1110, 2002. 16. PERREN, S. M., CORDEY, J.: The concept of interfragmentary strain. In: UHTHOFF, H. K , STÁHL, E. (eds. ): Current Concepts of Internal Fixation of Fractures. Berlin, Springer 1980, 63-77, 1980. 17. PERREN, S. M., HUGGLER, A., RUSSENBERGER, M., ALLGOWER, M., MATHYS, R, SCHENK, R., WILLENEGGER, H, MULLER, M. E.: The reaction of cortical bone to compression. Acta Orthop. Scand. Suppl., 125: 19-29, 1969. 18. PERREN, S. M., WINDOLF, M.: Cerclage - Improved technology applicable to minimally invasive osteosynthesis with special reference to periprosthetic fractures. In: AO Manual of Fracture Management - Minimal Invasive Osteosynthesis, in press, 2011. 19. RHINELANDER, F. W., STEWART, C. L.: Experimental fixation of femoral osteotomies by cerclage with nylon straps. Clin. Orthop. Relat. Res., (179): 298-307, 1983. 20. STADLER, J., BRENNWALD, J., FRIGG, R, PERREN, S. M.: Introduction of bone surface resorption by motion. An in vivo study using passive and active implants. Second International Symposium on Internal Fixation of Fractures, 62: 44-1982. 21. TOMAS, T., NACHTNEBL, L., OTIEPKA, P.: [Distal femoral periprosthetic fractures: classification and therapy]. Acta Chir. orthop. Traum. Čech., 77(3) : 194-202, 2010. 22. WÄHNERT, D., LENZ, M., PERREN, S. M., WINDOLF, M.: Wire cerclages. A biomechanical study on the twisting procedure. Acta Chir. orthop. Traum. Čech., 78 (3): 208-214, 2011. 23. WEISSINGER, M., HELMREICH, C, POLL, G.: Periprosthetic fractures of the hip. Acta Chir. orthop. Traum. Čech., 76(3): 179-185, 2009. 24. WINDOLF, M.,.PERREN, S. M.: Mechanobiology. In: AO Manual of Fracture Management - Minimal Invasive Osteosynthesis, in press, 2011.